There are so many choices to be made when completing a college degree, it is important to be aware of how those choices will affect your future. Problem after graduation: You’ve acquired a massive amount of student loan debt. Solution while in school: Only borrow the student loan funds that you actually need. The financial aid office at your school may award you several thousand dollars for a semester of school. You don’t have to take it all. You can either request a lesser amount or no student loans at all. While it may be tempting to accept the funds in order to have extra money to spend on fun things, student loan funds should only borrowed to cover tuition, books, supplies and other miscellaneous fees. 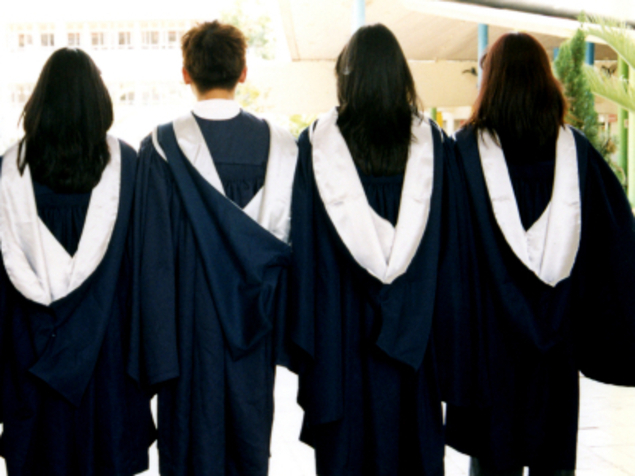 Graduation may seem like it is a long way off and you don’t need to worry about repayment. But, remember, the time will pass and you will soon be faced with a large student loan bill that includes tons of interest. By borrowing less now, you create a better situation for your future. Try applying for scholarships instead. Problem after graduation: Your degree didn’t give you enough marketable skills. Solution while in school: Take on a double major or a minor. So you love great literature, art and theater. I do, too! The job market, on the other hand, does not always share the same sentiments. It is of the utmost importance that other skills are acquired while you are majoring in a subject you love to study. By selecting a second major or minor in a field that is a bit more practical, you will better your chances of finding a job after graduation. If you are an Art or English major perhaps you can also study graphic design, web design, or marketing to increase your skill set. This will open up more job opportunities after graduation. You will be able to combine your talents, along with your marketable skill set, to land a great job. Problem after graduation: There’s no work experience on your resume. Solution while in school: Find an internship and/or a part-time job. It is not enough to simply earn a college degree. Most of the time just telling a potential employer that you have a certain degree won’t automatically get you the job. Employers want to see that a new graduate also has experience in the workforce. Internships are a great way to gain hands-on experience while you are still in college. Interns generally work for a company in the field they would like to work in after graduation. Some college students complete an internship every summer of their college career, or complete multiple internships over one or more school years. Internships not only give the student experience, but also potential references, which are necessary when applying for a new job. Who knows? Your internship may even lead to employment! Your school’s career services office may be able to match you with internship opportunities or you can check out your internship matches on Fastweb. Part-time work doesn’t necessarily have to be in your chosen field, but it can be beneficial on a resume. Steady part-time work will show a potential employer that you are able to hold a job. It will show that you understand what it means to work, to be a part of a team and to be responsible. You may also earn usable references from your part-time job as well. By working on just these three tips while in school, you may be able to avoid having the same regrets that many college graduates have, once it’s time for your graduation.